The new survey by Survation for the Mail on Sunday has Ukip nine points ahead of the Conservatives in the constituency. The pollsters found that 40% of those who voted Tory in 2010 were planning to switch their vote to Ukip. There is another by-election in Clacton before the Rochester vote, with fellow Tory defector Douglas Carswell a clear favourite to win and become Ukip's first elected MP. A senior Conservative Eurosceptic has reportedly warned businesses that they will pay a "very dear economic and financial price" if they speak out in favour of Britain staying in the European Union. According to the Telegraph, former minister John Redwood told a fringe event at the Conservative Party Conference that firms should "keep out" of the debate and "not meddle in politics". The newspaper quotes Redwood as saying: "If they don't understand that now they will find those of us organising the 'get out' campaign will then make life difficult for them by making sure that their customers, their employees and their shareholders who disagree with them - and there will be a lot who disagree with them - will be expressing their views very forcefully and will be destablising their corporate governance." 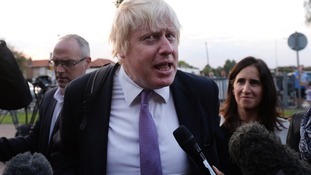 London mayor Boris Johnson has issued an appeal to would-be Tory defectors urging them not to break ranks and join Ukip. Writing in his weekly column in The Daily Telegraph, he said Conservative MPs would be "utterly nuts" to desert the party as they simply risked handing power to Labour at the next general election. Mr Johnson said he thought reports that two or three more MPs were preparing to follow defector Mark Reckless and jump ship were "fanciful". But he wrote: "Let me try to reason with any in my party, the folk who want to launch themselves headlong into the silage, because I genuinely think that they (if they indeed exist) must be utterly nuts. "There are only two people who are in a position to take the keys to Downing Street next May, and they are David Cameron or Ed Miliband. "If you really want to let this country sleepwalk into a Labour government, then that is your prerogative. You can close your eyes and let it happen. You kip if you want to; the rest of us are going to fight and win."